Recently, I happened across a wonderful company which was working with colleges and some other schools by manufacturing and providing all-gender or gender neutral signage for public restrooms. 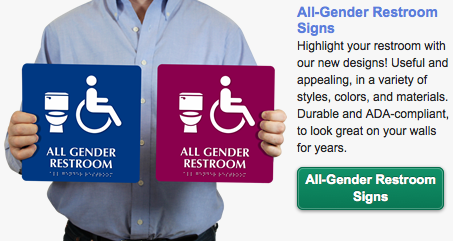 These ADA compliant signs help signify to our trans* and gender nonconforming community that the bathrooms are for all. They also come in many colors, allowing for schools to unify signage across an entire school building.